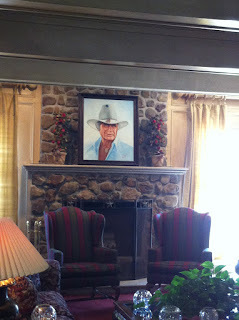 I took a tour group to Southfork Ranch on Tuesday. In all the years of watching the old, and now new, series I never took a trip there. I highly recommend going. 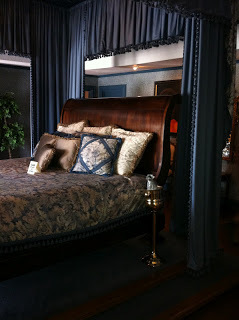 The staff were very welcoming and the property is lovely. When the series debuted in 1978, the home was owned by a family so only exterior shots were allowed. The interior shots were taken at a sound stage in Culver City, California. 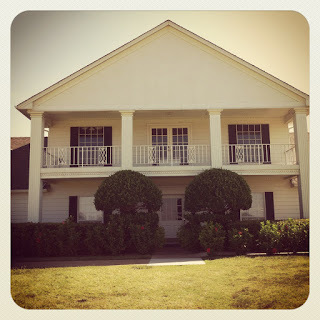 Now with the series renewal, everything is shot in Dallas; both on the Southfork property and in a sound stage in Dallas. Here’s the back patio near the pool. 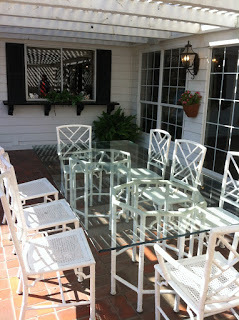 This is where the Ewings would gather in the mornings for breakfast. Remember Miss Ellie asking Teresa for some eggs for Bobby? I didn’t take a photo of the infamous pool because it was covered for a scene they are shooting tomorrow (we missed seeing the cast by one day!). 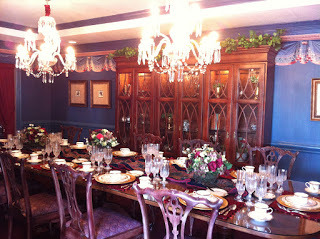 The Dining Room where many a close, family dinner was held. Jock’s photo above the fireplace. 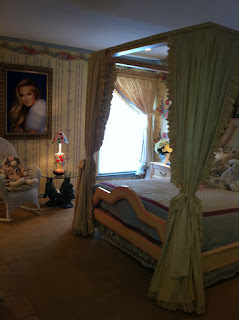 Lucy’s bedroom. 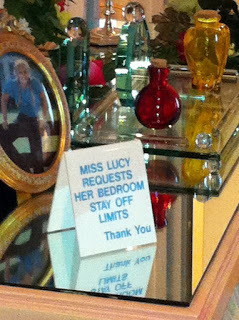 I think the signage on her dressing table was supposed to be a little tongue-in-cheek. 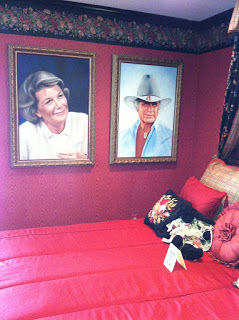 Jock and Miss Ellie’s bedroom. The thing that several of us said as we were standing around looking at each room is that logically we know there is no Ewing family living here. But, it seemed very invasive walking around seeing things and seeing the character’s photos. Almost as if they were going to walk in from the pasture or Tom Thumb while we were there. The house is not as large by today’s standards. But for the 70s, when the house was originally built, it was considered a palace. It has changed owners several times over the years. The most recent owners purchased the house in 1992 and it was totally redone. It’s still a step back in the 80s. 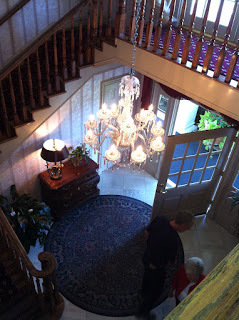 A view of the foyer and staircase. 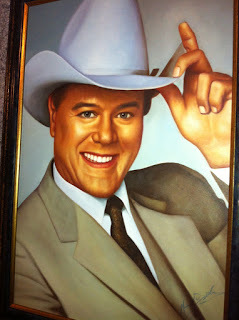 And his trademark hat and smile on the wall. 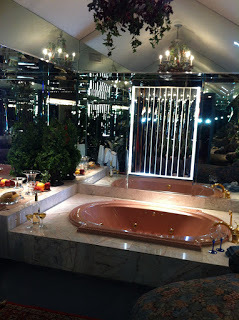 The master bath was totally surrounded in mirrors. Mirrors everywhere. You have to have quite a positive outlook on your body to bathe in this place or wear a mask over your eyes. This is the exterior front shot of the house.